Ferrite measurement or delta ferrite measurement and the control of ferrite phase in both Austenitic and Duplex Stainless Steels is important to maximise the physical, mechanical and corrosion resistance of the material. Ferrite is an important constituent of stainless steel as it helps prevent hot cracking when the material is welded. In Austenitic Stainless Steels too much ferrite will lead to a reduction in the corrosion resistance properties of the material. In the pharmaceutical industry a lot of research has been done in relation to the ferrite content and it effect on corrosion resistance and “rouge”. This research has shown that ferrite content in excess of 5% has a negative effect on corrosion resistance. The introduction of 1.4435-316 Stainless Steel which has 0% ferrite phase allows for the fabrication of piping systems, vessels and other items of plant and equipment with very low to zero ferrite content. The control of welding and ferrite measurement of components is important to ensure that zero or extremely low ferrite content is maintained. Austenitic Stainless Steels are low strength materials so for more aggressive, higher temperature and structural applications Duplex Stainless Steels are used. These stainless steels contain a mixture of ferrite and austenitic phases. This increases the properties of Duplex Stainless Steels; toughness so it can be used at very low temperatures, strength so it can be used in structures such as bridges and its resistance to stress corrosion cracking which can be a serious problem in aggressive environments at elevated temperatures. Control of the ferrite content of components prior to and after welding is important to ensure that the material properties are maintained. Advanced NDT Solutions provide ferrite measurement and can assist in the control of welding to ensure that whatever properties are required, they are measured and controlled to ensure compliance. 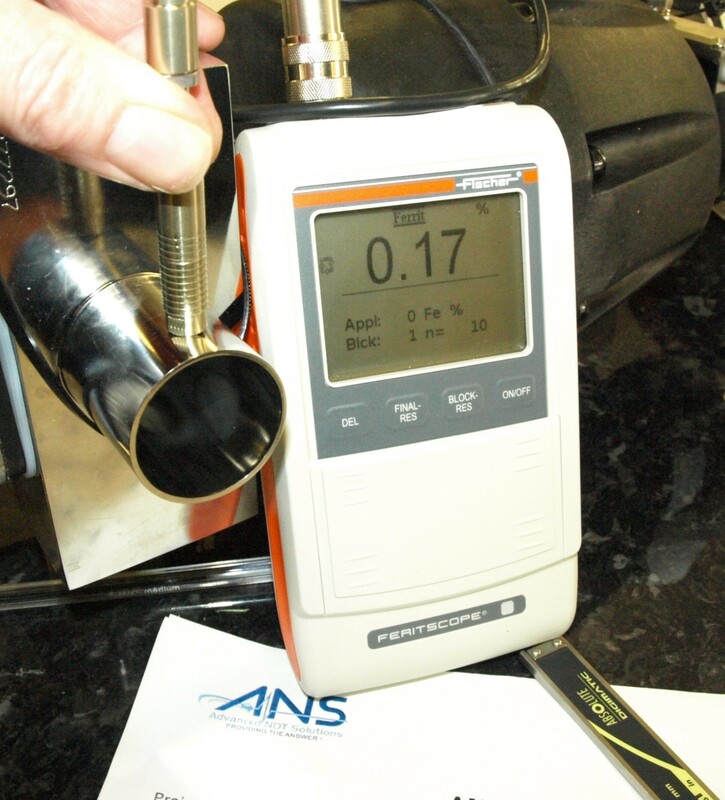 ANS is an experienced Advanced NDT Services company with years of experience in providing quality advanced Non Destructive Testing services; working in Ireland and globally. Copyright © 2015 ANS NDT. All rights reserved.